Developed by Plinga, it is with a lot of charm that Dreamfields will train you in its world perfectly fairy. 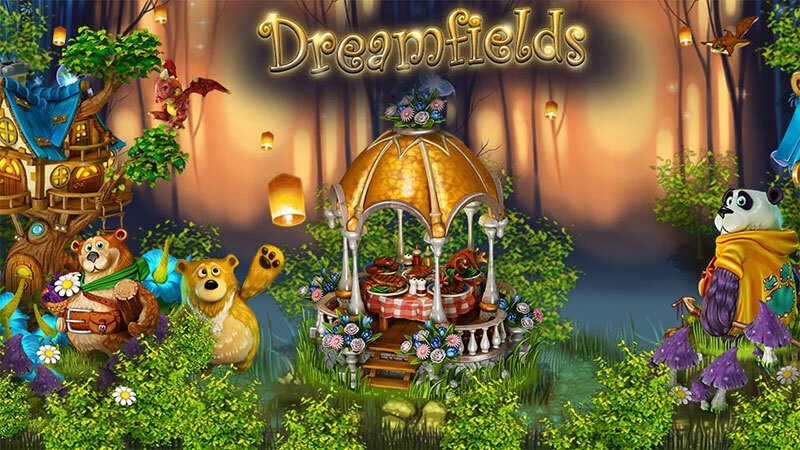 Dreamfields is a free farm game, unique, browser-based. Magic, animals talking, it's time to see what Dreamfields offers us in the long run. Beyond an isometric 3D that lends itself well to the genre, Dreamfields benefits above all from a worked and colorful environment. This one accentuates the immersion in the enchanting universe that the game proposes. The music of the game invites you to the voyage and sticks perfectly to the universe in which you are. You will evolve in a forest where you will multiply the interactions with all kinds of imaginary creatures. Bear, Dragons and other animals will be your fellow travelers. Indeed, they will help you in daily tasks if you fulfill the conditions they ask you. For example, a bear may ask you for jam in exchange for help. Adept of crafting, you will quickly understand that you need to manufacture this food but also buildings. Between buildings and quests, your schedule will be well loaded and boredom nonexistent. If you are wondering where to find the resources you need, know that the environment is your source. Do you need wood? Cut trees. Do you need fruit? Go pick them. You just found a cave? Explore it. Like any self-respecting farm game, you can cultivate your land and create resources. An excellent system of levels is set up in order to structure your progression and thus grant you new possibilities at each level gained. Dreamfields is for anyone wanting to escape a bit of their daily lives to join a fun place. Do not hesitate and go on an adventure to make this forest, the place of your dreams. In the meantime, I must confess that you have very pretty cows!